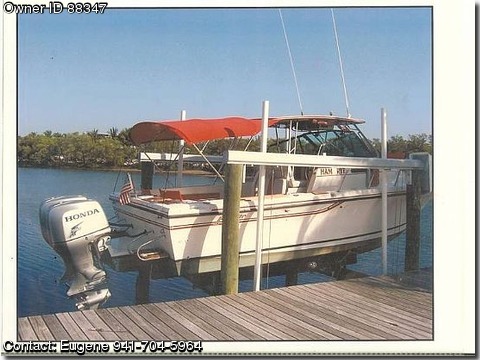 2-220hp Honda Motors with 200hrs bought new in 2002 for $18,00 each, full canvas, 10 rod holders, New $5,00 transom, lg cooler with pump, and 2 extra coolers, 2 specially made teak chairs with matching red cushions, cuddy cabin, new never used porta potty, always lift kept, storage. Garmin 192C GPS available, and Furuno FCV582L Fishfinder available. A get fish or cruising boat in GREAT condition.